We have been selling Venture Tape for about as long as they've been in existence. Venture Tape has been making industrial tapes of all sorts since 1980, right here in our hometown of Rockland, Mass. After they were purchased in 2007 by the behemoth 3M Company, they stopped making the more exotic foils like black backed and New Wave, but we still count on them for standard copper foil in various widths. Folks just love our EDCO copper foil. 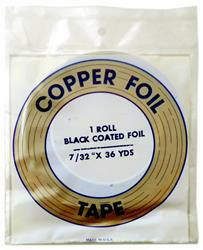 Made of "dead soft" copper, it is just as the name implies, soft! This softness makes it easy to work with. It offers little resistance to being shaped and it bends easily. Our customers have told us that it conforms easily to the glass, and adheres very well. EDCO has been in business even longer than we have -- since 1954 -- so we figure they must be doing something right. Let us know what you think.